For retreats, arrival and registration for new participants will begin at 6:50am. For experienced participants arrival and registration begins at 7:50. Retreat ends at 4:30pm. FMI or to register for a retreat, email, northernlightzencenter@gmail.com or call (207) 835-1480. Jan 26, Mar 30, May 25, Jul 27, Sept 28, and Nov 30. Entry time is 9 am and end time is noon. Monthly Dharma Talks on Wednesday evenings will be on the Wednesday prior to the last Saturday of the month. Contact us for more information. Registration required for all retreats. 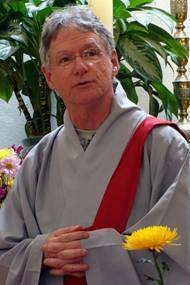 Terry Cronin, JDPSN started practicing Zen and Christian contemplation in 1980 while a student at Yale Divinity School. Since 1986, he has trained in the Kwan Um School of Zen. He is Guiding teacher at the Northern Light Zen Center in Topsham, Maine, and received inka from Zen Master Soeng Hyang in April 2014. For the past 21 years he has worked in a variety of roles for hospice programs, currently serving as a hospice chaplain. He lives in Maine and has one adult son.